In mid-September, six of the U.S. sandwich chain Subway’s partners in Russia sent a letter to the franchisor demanding that it reduce purchase prices for PepsiCo products as part of a marketing contract. Furthermore, the franchisees, which control 12 percent of the Russian chain, refused to pay royalties. As a result, they have managed to secure a price reduction in what experts have described as a unique case for Russia. In late June 2014, the U.S. chain Subway Russia LLC received a letter from six of its sub-franchise partners, reports the Russian business newspaper RBK Daily. The letter, which concerned products manufactured by the soft drinks company PepsiCo and brewer Efes, said that the purchase prices set for the franchisees in the licensing agreement were not competitive compared with the prices of other fast-food operators. For example, syrups and Pepsi's 7UP drink were sold to Subway at prices three times higher than to its competitor, KFC. The six franchisees own about 80 Subway restaurants in Moscow and the Moscow Region, i.e. they control over 12 percent of the Subway chain’s outlets in Russia. As a result, in an unprecedented move, the restaurants froze royalty payments to the brand owners. The franchisees' refusal to pay royalties had its effect. On Sept. 18, 2014, PepsiСo decreased factory prices for its products for the chain's restaurants in Russia, RBK Daily said, citing Subway Russia LLC vice-president Gennady Kochetkov. According to a source at the chain, the price reduction was as much as 50 percent. Subway franchisees cannot refuse to purchase PepsiCo or Efes products altogether because they are Subway Russia's strategic partners. The general franchisee guarantees the suppliers that the chain restaurants will serve as an advertising platform for their products. Maxim Klyagin, analyst with Finam Management investment company, says that this is quite a typical example. “One of the downsides of a mechanism like franchising consists of often cumbersome requirements set by franchisors, for example, as regards business processes or individual elements and terms of partners' operations, including purchasing policy and product-mix, which, objectively, far from all franchisees are ready to meet," says Klyagin. Still, he adds, more often than not these conflicts can be resolved through negotiations. 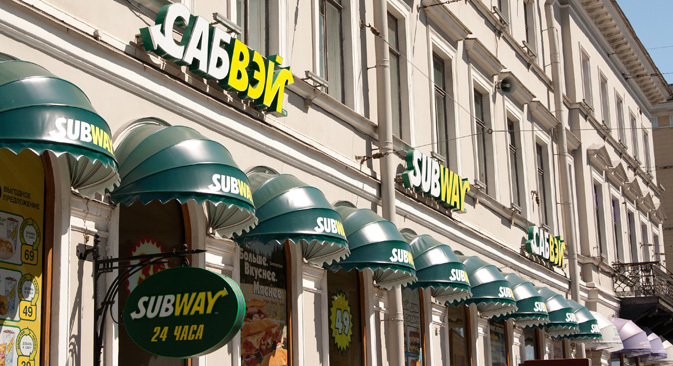 Experts point out that the case of Subway demonstrates the difficulties of developing franchising in Russia. Subway is currently a major franchising chain in the country, with 691 restaurants across Russia as of late July 2014. At the same time, in cash terms, the chain is lagging behind competition. According to Euromonitor International, Russia's fast-food market in 2013 was worth some $9.4 billion. Subway is the third biggest player in terms of the market share (3.3 percent), after Burger King (5.1 percent) and McDonald's (20 percent). "Just three to five years ago, it was quite revolutionary for a franchise owner in Russia to not just sell the license but also ensure raw material supply standards," he says. As a result, he adds, some franchisees were reluctant to share their revenues with the brand owner. "Having grown a business to a certain level, franchisees often refuse further cooperation and, with minimum rebranding, launch a chain of their own," explains Balakirev. As a result, one of the alternative types of franchising is developing in Russia. This is reverse franchising, which is being actively promoted by one of the country's major food retailers, X5 Retail Group. Under the scheme, each outlet has its own bank account and at the end of a month, the franchisee receives a fixed share of sales. At the same time all the goods belong to X5 Retail Group and are not transferred into the outlet's ownership. For its part, until 2013, fast-food giant McDonald's was developing in Russia, unlike on other markets, without selling franchises at all, but exclusively via the head company. According to Maxim Klyagin, on the whole, franchising instruments have become more widespread in Russia in recent years. Ilya Balakirev, meanwhile, points out that one should not forget about the associated political risks. "If relations with the West continue to worsen, we believe that the probability of more and more Russian chains severing ties with their foreign franchise owners is significant," he says.